We aimed for #badbisexualface here, me and Tara Avery, longtime bi trans advocate, cartoonist and publisher. This image was used by Pasadena Star News in 2014 as part of their story. Huge massive response led by @stillbisexual, @binetusa, and many others! News articles aplenty! AND, THE BEST NEWS? 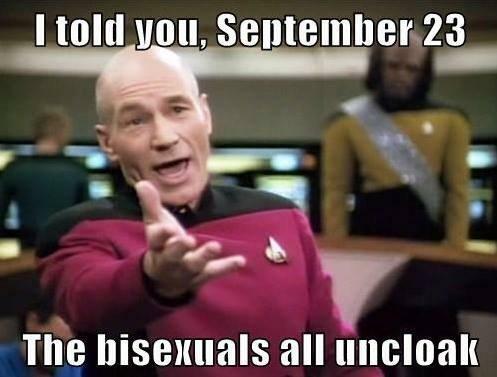 Prior images from bisexuals are still on the Twitter media server as evidenced by the media links from #biweek still serving beautiful bi, pan, fluid and queerness. I've embedded the spreadsheet below and you can download this sheet here in case you delight in bisexual images of proud bi people and their cats, owls, and kids as much as I do. Millions of bisexuals await the opportunity to be seen using their name, so please sign the petition to Twitter as created by bi trans non binary rock star Jen Yockney, MBE, the longtime bi organizer who runs bivisibilityday.com. Here's hoping this is the last time we'll have to scream and plan protests to reclaim the very use of our name!